The summer is a wonderful thing when you’re looking at creating a whole bunch of memories and happy times with your loved ones. But, are you ready for the heat and the challenges that it brings? What about your pet? Just like us, our pets can have problems with the heat, but with them, it’s less obvious in that they can’t tell us, and the problems can occur much faster. Dogs love going on walks and playing outside which is always fun for the family. However, when it comes to the heat, you’re going to have to be more aware of those casual walks. You can help your dog become more comfortable in the heat by helping him get access to shade. Be sure your dog always has access to water, maybe keep those walks or play sessions a little shorter than normal and consider walking earlier in the am or later in the evening when the sun isn’t present. When it comes to taking your dog for a walk, remember the temperature of the pavement. If it’s too hot for the pads of your own feet, then it’s very hot on your dog’s paws, too. Sure, they’re pads are a little less sensitive than our feet, but don’t dismiss the heat of the ground beneath you! Consider dog booties, different terrain like going off-road and again different times of the day and he’ll thank you for it! The hardest thing in the summer time is resigning yourself to not bringing him along for car rides to the grocery store or your regular errands. 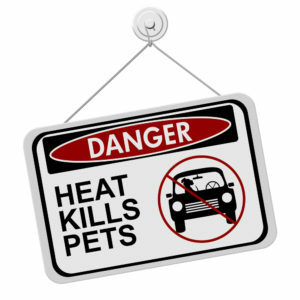 Unless you are not making any stops, or they are pet-friendly stops, leaving him in the car should not be an option!! The car will become desperately hot in as little as 10 minutes, and your dog could pay the price with his life. Remember that he is sitting in the hot car with a fur coat on and without water. It wouldn’t take us long to get dangerously overheated, so your dog can just as well. When it comes to cats – who are known for being sun worshipers – and other household pets such as rabbits or guinea pigs, etc, the goal is just to make sure they have access to shade and lots of fresh, cold water. Keep an eye out for signs of distress such as panting, lack of appetite, change in bathroom habits, or an unusual amount of lethargy. This will alert you that there is a problem. The best way to help that beloved fur baby of yours is to consider pet insurance. This is a protective agent that will help cover costs of vet bills from office visits (including emergency ones), behavior and hereditary conditions, and even illnesses or accidents . It can offer you peace of mind knowing that you’re protected if you need to take your pet in for a check-up during a heat wave or other medical necessity. It also helps you to know that you’ve got help on your side when it comes to your pet’s health and safety in the hot Texas summer heat. Just what you need to get back to enjoying your summer plans! Contact Paula Smith Insurance at (281) 488-8880 with any questions about the particulars with pet insurance or any other insurance for that matter because we want to be your resource for your personal insurance needs.